TerraTrike tandems are a safe and easy way to enjoy riding with a loved one or friend. Each is designed to meet the needs of different riding styles, and they do so brilliantly. 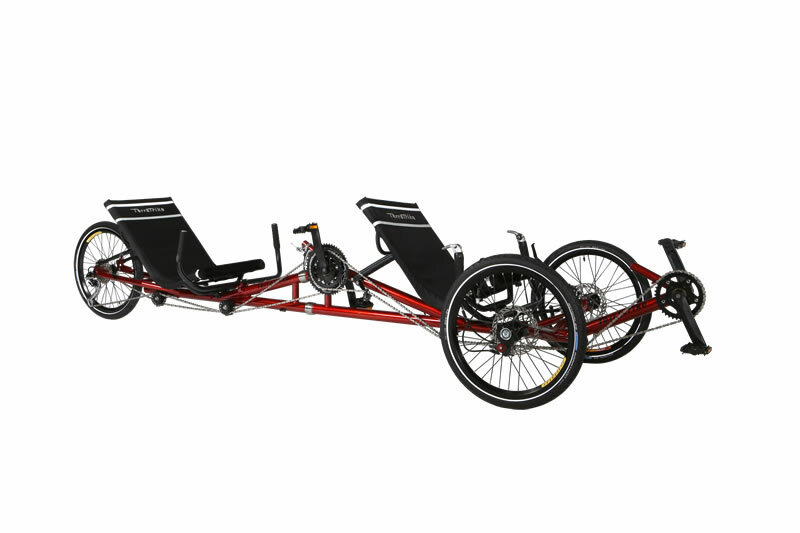 The Rover Tandem is a life changer for many couples who want to get out and ride together, as well as parents or relatives of people with adaptive needs. Utilizing the frame design of our Rover trike as a platform, the Rover Tandem Attachment can be used to transform a Rover i8 into a tandem and back again. The high seat and generous weight capacity of this tandem make it accessible and comfortable. Since the Rover Tandem is designed around an attachment, it can be broken down for storage or transportation. For the ultimate in partnered riding, you cannot beat the performance and quality of the Tandem Pro. The high-performance construction and components of this tandem trike make full use of the power of two riders. The Tandem Pro is sure to turn heads as you enjoy one of the most fun ways to spend time with a partner outdoors. The Tandem Pro is proudly made in the United States of America. Our tandems are both versatile and well suited to meet the needs of nearly any pair of riders. The Rover Tandem Attachment can be used with a Rover and can hold a total weight of up to 500 lbs. The Tandem Pro is fully decked out with a chro-moly steel frame, hand-built Velocity wheels, Schwalbe Marathon tires, Avid BB-7 disc brakes, and an FSA Gossamer Triple 170mm crankset. Both are available with our Independent Pedaling System (IPS), meaning one rider can coast while the other rider is pedalling.